The chemistry of volcanic rock on Mars offers a picture of the thermal history of the planet, according to scientists in France. The findings could provide a reference point for the evolution of other planets, they say. David Baratoux, Michael Toplis and colleagues from the University of Toulouse analysed data collected by the gamma ray spectrometer (GRS) aboard Nasa's Mars Odyssey spacecraft. The GRS measures the concentration of different rock forming elements on the Martian surface to help scientist understand the planet's geological history. The team concentrated on data collected on three principle elements - thorium, silicon and iron - from volcanic regions of different ages on the surface. The concentration of thorium, although low in the Martian mantle, is a good measure of how much the interior has melted, explains Toplis. A naturally radioactive element, it emits gamma rays continually, and when heated does not stay locked in solid minerals, but is easily transported to the surface. The concentration of silicon, in the form of silicon dioxide (SiO2), is a good measure of the depth at which melting occurs, Toplis continues. The concentration of iron can then be used to validate inferences made from the thorium and silicon data, he adds. 'We can convert the chemical composition into temperatures and pressures, which can be converted into just how hot the Martian mantle is,' Toplis says. 'We can then quantify how much it has cooled over time and compare that cooling rate with what you might expect with other models,' he adds. The team found that the potential temperature - the temperature that the mantle would have if it came to the surface with no change in enthalpy - for Mars was approximately 1400ºC, which is similar to the value calculated for Earth. They also observed about an 80ºC spread in values between older and younger volcano sites. 'We are suggesting there is about an 80ºC cooling of the planet over the last two or three billion year period,' says Toplis. 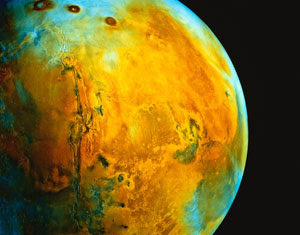 'This work does a great job integrating a new geochemical data source from Mars with existing geophysical understanding to make the very significant conclusion that the cooling rate of Mars is actually slower than that of Earth,' says William Boynton, an expert in geochemistry at the University of Arizona in the US. Earth is not behaving as the models predict, says Toplis. The team hopes to look at the geochemistry of rocks outside the volcanic zones on Mars next in order to further explore the mineralogy of the planet. 'We also want to use the data to understand volatile delivery from the interior of the planet to the exterior,' Toplis adds.